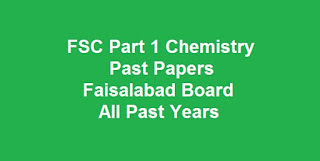 Download FSC Part 1 Chemistry Past Papers by BISE Faisalabad Board for All Past Years to prepare for the annual exams of inter part 1 for the chemistry subject. We know that students of intermediate fsc course are looking for the past papers to get highest marks in exams and here we have uploaded the fsc part 1 chemistry past papers. If you want more past papers and loving www.TaleemWala.com than do share this article with your fellow students and comment below your questions.